Washington Army National Guard CH-47D Chinook pilots Chief Warrant Officer Keith Doot (left) and company commander Major Anthony Bolante take a quick self portait upon landing in a tactical landing zone during a training mission in Washington. September 8, 2001. Life was good. I just took charge of the 250 soldier/pilot Washington-Oregon Army National Guard CH-47D Chinook helicopter company with the rank of U.S. Army Major. As the ritual of Army ceremonies go, I was honored to take command of another helicopter unit, my third aviation company command in my career. Nothing is more invigorating to us as human beings as challenge. I was looking forward to three years of being in charge of a fine group of volunteers who balance their fulltime civilian careers with their civic duties as volunteers of the National Guard. I knew that we'd be doing water bucket duty fighting forest fires and the occasional high-altitude mountain rescue along with our regular tactical training and air missions in support of Active Duty military forces (Army, Navy, Air Force and Marines). Little did I know that only three days after accepting the guidon (in Army speak, that's the unit colors/flag), on September 11, 2001, my life as a "Citizen-Soldier" would completely change. It's been a whirlwind ever since. I must admit, many of you must be wondering, "what the heck does this have to do with us sports photographers?" Well, except for the few of you sports shooters that know me, I have to explain that for the past 17 years, I've had the challenge, and honor, of balancing my career as a photojournalist/sports photographer along with my career as a National Guard officer/pilot. Nothing has been more rewarding than finding that equilibrium that has allowed me to succeed in both careers. The support of my wife, my family and my photo-colleagues such as many of you, have spurned me to pen this brief story. It's actually therapeutic for me to let loose a little bit and write this story after not being able to "say a lot" about my ulterior life as a military pilot for the past three years. But now that I have recently completed my tour of duty as the unit commander and have been reassigned as a staff officer, I just wanted to somehow express my thanks to the many of you who have kindly supported me and just plain "cared" about my duties in the Guard. With Major Anthony Bolante at the flight controls, CH-47D Chinook helicopter flight engineer Staff Sergeant Romeo Bucasas photographs another Chinook carrying a 16,000-pound external load near a high, snow-capped peak in the Cascade Mountains. As the Seattle-based photographer for Reuters, on September 11, 2001, I was right in the middle of covering San Francisco Giants slugger Barry Bonds' run for the MLB homerun record and the Seattle Mariners amazing 116-win season. I was traveling to-from Safeco Field in Seattle and Pac Bell Park in San Francisco to work with Reuters senior photographer Mike Blake who is based in LA and Lou Dematteis, our San Francisco shooter. We covered Bonds who was hot at-bat and was climbing the ladder on the homerun season tally list as he approached St. Louis Cardinal batter Mark McGuire's 70-HR record established in 1998. It was hard to imagine something more exciting to me at that time other than covering the Mariners incredible winning season and Barry Bonds as he neared, and eventually, topped the homerun record. Then the events of 9/11 happened. We all remember what we were doing that day, and some how, the heinousness of the terrorist acts seemed to eclipse the incredible sports records that were being set right in front of my camera lenses. It was a bittersweet time for me. I'll never forget sitting in a San Francisco hotel room in early October 2001 while covering Barry Bonds when the U.S. military's first bombs were dropped against Taliban and Al-Queda forces in Afghanistan. All I could think was, "here we go ..." Since then, detachments of my unit have been deployed to both Afghanistan and Iraq. Gratefully, I was able to send and deploy some of the finest soldiers in my unit. I have never liked the idea of "sending one of my own soldiers down range (to war)" without me going myself. It's an incredibly tough thing to do, but as the unit commander, it has been a requirement in this day and age when the majority of the U.S. military (active and reserves) is actually operating in hostile conditions somewhere in the world. I can happily report that all of my troops are safe and sound in their foreign theaters of operations and intend to do everything in my power to keep them that way. 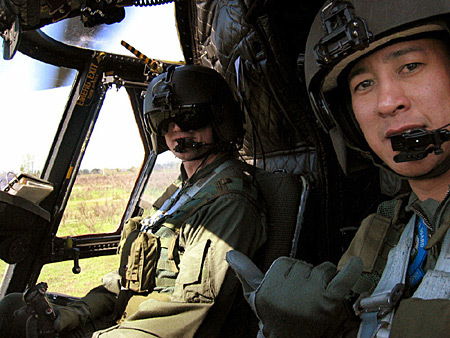 Reuters photographer by day, National Guard helicopter pilot by night. 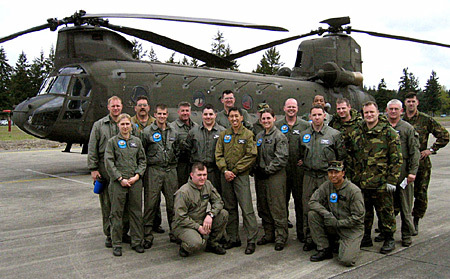 Reuters Seattle photographer Anthony Bolante (center) stands with some of his pilots and flight engineers after his last flight as the unit's company commander. What's amazing is the demographic of my fellow Guardsmen. We have everything from commercial (aka 747 and 737 type) pilots who fly Guard helicopters around six days or more a month on top of their fulltime civilian jobs flying for a major airline. Amongst my fellow Guardsmen, there is an incredible conglomeration of careers including police officers, firefighters, school teachers, accountants, engineers, SPORTS PHOTOGRAPHERS, etc. You name the profession, chances are you'll find it in my unit. It's just humbling to work with individuals who have constantly work two fulltime jobs in service of their country. As for the type of aircraft we fly, the venerable Boeing CH-47D Chinook is a fourth generation "Heavy Lift" helicopter that was birthed during the 1960's Vietnam war. Four "upgrades" later, the CH-47D Chinook is the helicopter most visible on television news coverage of Afghanistan and Iraq in the past three years. I used to be an attack helicopter company commander a decade ago, in charge of AH-1S Cobra helicopters during Desert Storm. Those gun ships were slick. But in this day and age, the Chinook has surfaced to the forefront as the humanitarian assistance aircraft of choice. Basically, the helicopters we now fly have an abundance of power and cargo carrying capacity. This makes the Chinook a high-demand aircraft in the military theater of operations and during civil disasters. For those of you who don't know what a CH-47D Chinook is, it's the behemoth 100-foot long, gigantic twin rotor 30-soldier and equipment carrying helicopters you see nearly nightly in the news. Each aircraft is crewed with three to five personnel, depending on the complexity of the missions. Flying night vision goggles with a heavy external load like a HUMMVEE dangling below the fuselage as we fly about 100 knots at treetop level on a dark night is about as exciting as it gets for us. Aircrew coordination and communication are paramount within the aircraft. Add on top the possibility of some "bad guys" trying to shoot us down, this is the type of realistic training that we practice every time we fly a training mission. 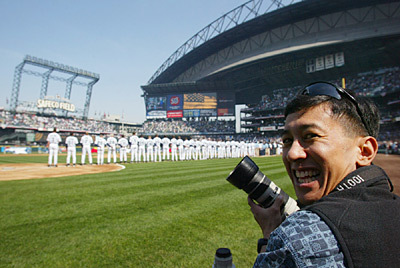 Reuters Seattle photographer Anthony Bolante covering the Mariners Opening Day game against the Angels at Safeco Field on April 6, 2004. 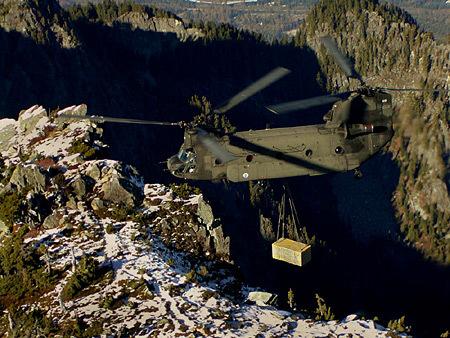 The Chinook is the US Army's most powerful aircraft and it has the capability of supporting numerous civil support missions such as carrying a 16,000 lbs., 2,000 gallon water bucket that we use to aerially dose wild land forest fires. In comparison, our "little brother" the UH-60 Blackhawk carries only a 500 gallon water bucket. The Chinook can carry a lot of water and thus have an impact on fighting forest fires. Also, the Chinook has the honor of being the only aircraft that successfully conducted a high altitude mountain rescue at 19,000 feet high up 20,320 - foot Mt. McKinley/Denali in Alaska. 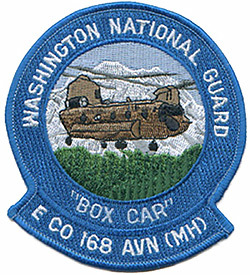 The Washington Guard Chinooks are always poised if needed for rescues in the Cascade Mountain range including the 14,410-foot Mount Rainier. Being a mountain climber myself, I know how hard those Chinook engines are working in the thin air. I write this story only three days after a injured climber was plucked off the Liberty Ridge summit route on Mount Rainier by a National Guard Chinook. The sight of a CH-47D successfully hoist-retrieving an injured climber off the steep mountainside made me proud since that aircraft was from our sister unit just South of us in Oregon. There are sooooo many photos that I have shot while on Guard duty that I can't even show you guys for obvious security reasons. It has been tough being a photographer while on duty though, since my Guard job clearly dictates that I focus on being an commander/pilot and NOT being a photojournalist while on duty. The few photos that you see with this story were shot by me and some are from my Guard colleagues whom I handed my camera too take photos while I flew the aircraft. I got to admit, these photos "don't do justice" for the level of professional risk we do in conducting our duties. photo assignments that we all as sports photographers hope to cover. Also, I now get to spend more family time with my wife Clarissa who has been incredibly supportive of my careers. In the meantime, I look forward to covering the Mariners this summer with a spell of relief. However, my baseball season looks as if it will be cut short since the Guard is not just quite done with me yet. I'll be attending the Command and General Staff College at the U.S. Army's Fort Leavenworth, Kansas from July 2004 through June 2005. Just when I thought that I had a respite, my superior officers decided that I needed to further my military education with me attending this select course. I'm honored, but a little bummed too. That means, I'll miss yet another MLB playoff season (not that the friggin' Mariners are going to make it this year !!!) and another Supersonics (NBA) and Seahawks (NFL) season. C'est la vie. For those of you Sports Shooters that I get to see this summer during the baseball season, please say "hello" to me around Safeco Field when you get the chance before I leave for Kansas in July. To my Sports Shooter friends like Brad Mangin, Bert Hanashiro, Rod Mar, Jed Jacobsohn, Justin Sullivan, Ben Margot, Eric Risberg and many of you photogs out there, thanks for the many words of support you've given me over the years. It means a lot to me. I do this duty because of you all. Ahhhhhh ... I guess photography is going to have to wait until summer 2005 as I don the Army uniform for another year of fulltime active duty military schooling.